When I first started playing with 68k macintosh systems around 1999/2000 (a Macintosh Plus) I connected an external SCSI drive to my Windows 98 system and was able to use an early version of Basilisk II with SCSI pass-through to format the hard drive. Now 18 years later, SCSI is an obsolete technology, and in general is not supported under the latest versions of Windows and the the Macintosh OS, although I believe Linux still has support. Luckily a skilled person on the internet has made 64-bit compatible drivers to support some of Adaptec’s cards under Windows 10 (sorry I’ve found nothing for the latest version of the Macintosh OS). 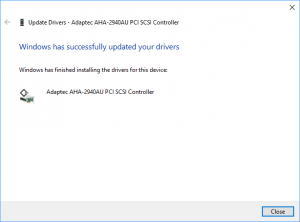 I’ve personally tested the Windows 10 driver for Adaptec AHA-29xx cards with an AHA 2940U PCI card. I’m not sure how much longer using SCSI controllers will be supported, so if you don’t already have working SCSI devices I’d suggest you invest in one of the more modern solutions such as SCSI2SD for setting up your classic Macintosh instead of using this option. But, if you’re like me, and do have a bunch of old hardware, it’s good to know we can still use it on our modern systems to setup our aging systems for at least a couple of more years. 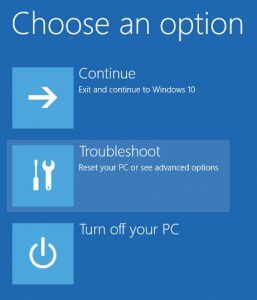 Signed Windows 7 64-bit driver for Adaptec 29320LPE – Ultra 320 cards (tested, installs under Windows 10 64-bit), you can skip to Step 3 if you are using this driver. Updated 2019/03/13: Shane’s suggested method is now blocked by windows Secure Boot Policy… you can turn off the Secure Boot Policy, but the methods I found are more complex than the original method to do this… so I’ve reverted back. Update 2018/12/31: Shane Cook (see comments) provided an easier way to install unsigned drivers. I’ve updated this post with his suggested changes. Wait for you computer to finish restarting, you should now be able to install the driver for your card. 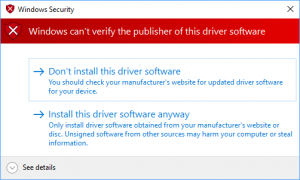 Windows should ask you if you want to install the unsigned driver (Figure 4), select install this driver software anyway. I’m assuming that you mainly want to get a SCSI device connected to your modern system because you want to setup an old hard drive, or removable drive for use with a 68k Macintosh System, or some other SCSI system from that era. As I mentioned in my intro paragraph, I originally connected an external hard drive and used Basilisk II’s SCSI pass-through feature to setup the drive. 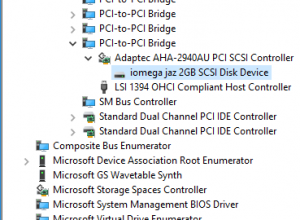 I haven’t been able to get SCSI pass-through working under Windows 10, so instead I now I attach the SCSI device/drive to my PC and then create a disk image to work with, then write the edited disk image back to the device/drive. I’m not the creator of these drivers, so I can only vouch for cards they have been tested on that work. Please comment to let me know what card you’ve used these with and did they or did they not work. Setting Up your 68k Macintosh Drivers, SCSI, Windows 10. permalink. When I download your Unsigned driver for Adaptec AHA-29xx cards there is only and entry inside for the 78xx scsi cards. Am I missing something ? The creator of the driver modified the 78xx drivers, if you look in the .inf file you’ll see entries for the 29xx series of cards, e.g. the Adaptec AHA-2940AU PCI SCSI Controller, I’ve updated the blog entry with a note. You can add the Adaptec AVA-2906 to the working cards list. I had 2940’s but no more, so I decide to try with the 2906. The setup included the PCI Adaptec 2906, a SCSI 50 pin ribbon cable and a 1.3GB SCSI MO internal drive. I followed your instructions and after rebooting the drive was online in Windows 10. Reading and writing was very good if not better than years ago. I loaded the 2940 drivers. I also can confirm SCSI still works on linux. We had a Workstation running Opensuse Tumbleweed that had two 300GB SCSI drives. That was less than 2 years ago. Next time I will try to mount one of the 300GB drives on Windows 10. I have an Adaptec 2940 PCI Card. I followed your instruction to the letter. Unfortunately, when I give the location of the djsvs.inf and the djsvs.sys files, Windows 10 (64 bit) tells me that it does not find any driver. Any idea what is wrong? Hi Kurt, not sure. I’ll test this again later this weekend, hopefully nothing has been changed in Windows 10 that prevents the installation. 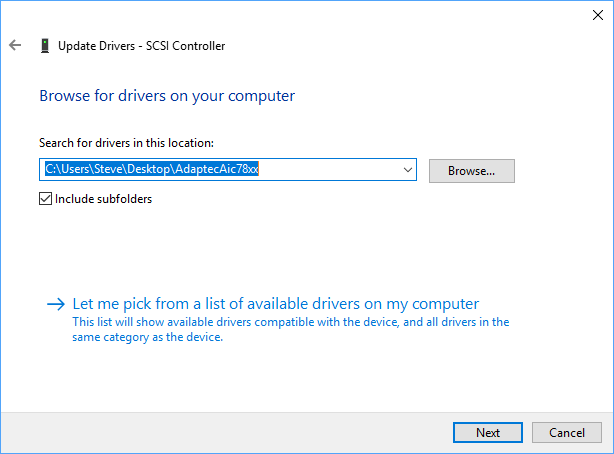 is your Adaptec 2940 card listed under “Other Devices?” (step 3.4). Also when you downloaded the .zip file did it have all 3 files (I updated the blog entry to list them). Thanks for prompt reply and for updating the blog. The Adaptec 2940 card is listed exactly like in your screenshot above, i.e. 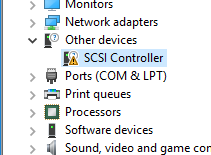 as “SCSI Controller” with the exclamation mark. All three downloaded and unzipped files are in my folder: djsvs.inf (18KB), djsvs.PNF (8KB) and djsvs.sys (87 KB). I assume that there is no aspi required under Windows 10? Please let me know if I can assist with any additional information. 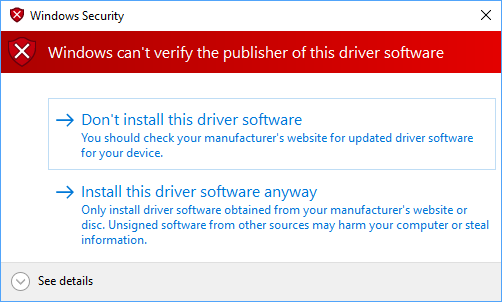 One more thing: the system tells me that it could “not find any drivers for this device” although I pointed it to the folder with the drivers. It appears to me that the system refuses the “unsigned drivers” although I went through the procedure in your step 2. Just tried with a clean install of Windows 10 build 1803 and was able to install the driver for my 2940AU card. It could be you have a version of the 2940 series that isn’t supported, or something else on you system is blocking the install. I’ve added some more screen shots to show the later steps so you can confirm how far you get. IBM Thinkstation S20, Win 10 Pro 64bit (1703), Adaptec AHA-2940UW PCI SCSI adapter. Thank You. thanks for putting together that information! I’m back just to confirm that your solution is working. My AHA-2940U2W has another chip set, and I could not solve the problem. It uses the driver aic78u2.sys (instead of djsvs.sys). So I bought an AHA-2940/2940U from Ebay, i.e. I circumvented the Problem. With the new card, the patch is working. P.S. If somebody comes up with a solution for the AHA-2940U2W, I am still interested. Can you provide more detail? E.g. what card did you try it with, did you have any other SCSI cards etc? Any additional information you can provide would be helpful so that others can avoid the issue. It worked as described with an Asrock H81 board PCI AHA-2940UW. After the driver was installed my DDS tape drive was listed as a cassette drive at the top of the device list. 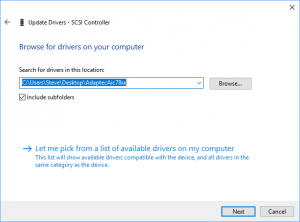 If updating the driver does not work try installing the driver manually by right clicking on the file “djsvs.inf” to install it. Thanks. I am backing up with tape and not accidently wiping out my files again !!!. 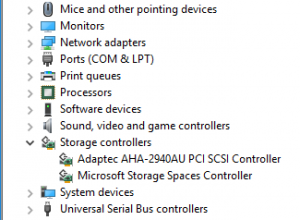 I followed the instructions and it worked great to install my Adaptec scsi card (AHA-2940) but windows 10 can’t (or won’t recognize my HP Scanjet 4C). Any suggestions from anyone? I haven’t used it, but it might be worth a try. The same case reported by Al. I followed the instructions and it worked great to install my Adaptec scsi card (AHA-2940) but windows 10 can’t (or won’t recognize my HP Scanjet 4C). I tried with VueScan x64 but it is not working very well because it identifies the scanner as HP Scanjet 6100, it seems that an update has to be done. Did Al give you feedback? I wish I could help more, but I mainly wanted to get this working so I could connect old storage devices, most of those don’t need extra drivers. You best bet would be to contact VueScan to see if they could help. To clarify, I’ve never used VueScan, or tried to use a SCSI scanner in at-least a decade. If you do get this working feel free to post here so others can benefit from what you figure out. Thank you for this article and the links to the drivers !! Installed the driver today. Quick and simple to do following your instructions. Works perfectly with my AHA 2940/2940U card and my Nikon Coolscan III scanner. Vuescan is essential for the scanner driver. For film and slide scanning you need the Professional Edition. Supported scanners can be checked at http://www.hamrick.com. A free trial version can be downloaded to check whether it works with a particular scanner. If the web site says a scannner is supported but it isn’t working properly contact Ed Hamrick via Support/Contact us on the web site. He is very good at responding. I managed to buy a new ‘Adaptec 29320LPE PCI-E 1x U320 SCSI Card’ from Ebay. This disables ALL driver checks, so be careful with future drivers. Driver would then install. Adaptec SCSI Card 29320LPE – Ultra320 SCSI. Now I just need to find an external a SCSI lead that will fit my SCSI film scanner….. Thanks Shane, I agree this is much easier method, I’ve updated the entry with your suggested change. Run “bcdedit /?” for command line assistance. Hi Keith, have you tried initializing the drive through Windows Disk Management application? Control Panel -> System and Security -> Administrative Tools -> Computer Management -> Storage -> Disk Management? I’ve used this method mainly for connecting and formatting removable media, and emulated drives (e.g. SCSI2SD). I had a typo, it should have been bcdedit.exe /set nointegritychecks ON, I’ve updated my blog. Also Windows now blocks this as part of it’s default “secure boot policy”. I’ve found a few ways to turn that off, but it makes this method, way, way more complicated. So for now I’ve reverted back to the original method which still works.